Police play an essential role in supporting bicycle transportation by enforcing the traffic laws that allow all road users to reach their destinations safely. As bicycle travel has grown in popularity, the public has asked law enforcement to become more involved in bicycling issues. This can present challenges for police, because misconceptions about safe bicycling practices and state law are widespread among the public. The Bicyclist Safety and Law Enforcement in-service training program was developed by the Coalition of Arizona Bicyclists in cooperation with the Glendale, AZ police department to provide the most accurate and relevant information available to Arizona police officers. The program covers relevant traffic laws, common crash types and frequency, best bicycling practices, and effective enforcement techniques so that law enforcement officers can be confident when discussing bicycling issues with the public, and can effectively prioritize related enforcement and outreach activities to promote public safety. This brief e-learning training video that will be used internally for all Glendale Police officers. Most of the material refers to state-wide laws and statistics; and is not specific to Glendale. The material was adapted for use in Arizona by the Coalition from Education Resources for Police created by BikeWalk NC. Special thanks for Glendale Police personnel for their help in developing and reviewing the presentation: Chief Deborah Black, Detective Dan Mooney, Detective Ted Yoder, Officer Andy Lynes, and narrator Bicycle Officer Brian Ong. Same as above but video but shortened to ~ 15 minutes by removing some Glendale-specific info. 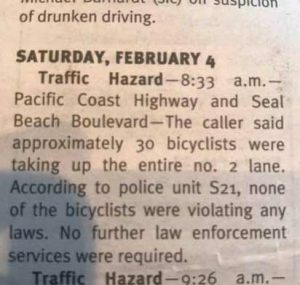 February 4 (2017): Traffic Hazard – 8:33 a.m. — Pacific Coast Highway and Seal Beach Blvd — the caller said approximately 30 bicyclists were taking up the entire no. 2 lane. According to police unit S21, none of the bicyclists were violating any laws. No further law enforcement services were required. Police undoubtedly found bicyclists were indeed using the entire right-hand lane, and it was narrow; correctly determining this is not a violation, and is in fact the recommended and most safe lane position. If invited, a member of the Coalition will come out to meet with the Police team and the local bicycle advocate to go over the script to ensure the material is adapted as necessary. There are a variety of NHTSA produced materials related to law enforcment and bicycling. Being federal in scope, the material is of necessity somewhat vague; since each state (and even some localities, unfortunately) has some minor variations. Enhancing Bicycle Safety: Law Enforcement’s Role refers to a 2 hour CBT (computer based training course) available on cd-rom (! indicating it may be quite old. I tried to order it but it’s not currently available). That page refers to a 7-minute NHTSA video, Enforcing Laws for Bicyclists Presented by Corporal Chris Davala of the Maryland State Police, and VP of the IPMBA. And contains some good, if general, information. “First, it’s important to repeat that bicyclists have the right to ride on public roadways, unless it is specifically prohibited”. In Arizona, the only known prohibitions on roadway use are those on fully controlled-access highways (aka “freeways”). Arizona State University has produced a video, which appears to be aimed at novice bicyclists, covering a wide range of bicycling issues that bicyclists might face in and around the ASU campus. Although it mentions various safety aspects, it also covers parking, and various administrivia specific to ASU. The video states well and plainly: “Never ride against traffic, on the road, in a bike lane or on the sidewalk”, and they use the excellent, updated graphic from the Pima County Safety pamphlet. This is good, strong safety messaging. I am not going to go off on the use of the term possible vs. the accurate term, practicable. This is the sort of bad advice that permeates these sorts of videos (see, e.g. the Chandler Police Dept’s Safety video where they “forgot” the narrow lane exception). Yes, when conditions are perfect, and the lane is wide enough to share safely, and the bicyclist is traveling slower than traffic, and there is no debris at the right, and no storm drains, and no broken pavement, and the bicyclist is not turning left, and the the bicyclist isn’t passing. When all those conditions are met, yes, the bicyclist must ride as far right as practicable. Proper lane position protects cyclists both against losing control from edge hazards, as well as being most visible to others. There is also a brief statement about sharrows much later in the video which might lead people to think sharrows grant some special privileges to bicyclists, and worse that the absence of them mean bicyclists must therefore ride as far right as possible — neither is true. See more on where to ride on the road. Reports on Facebook of Tempe PD selectively targeting bicyclists for “rolling stop” enforcement at 13th and Farmer. This is an intersection of two low-speed neighborhood collector roads, with an all-way stop. There have been 2 bike-MV crashes reported here (and 4 MV-MV crashes, no reported ped crashes) over the eight-year period 2009-2016; both both bike-MV crashes were faulted to the motorist; and in both no or minor injury resulted. On 4/11/2018 it was again reported similarly on 5th near Farmer. Effective enforcement of bicycle safety laws starts with officer training. Most police officers, however, receive little if any training on traffic safety laws as recruits and once on the job are likely given no or limited direction by leadership to focus on non-motorized users. “Cops don’t enforce laws they don’t know and won’t enforce laws they can’t defend,” pointed out Peter Flucke, President of Wisconsin-based WE BIKE, etc. which has delivered bicyclist and pedestrian safety training to law enforcement officials in more than 30 states (some through SHSO-provided funding). That fact, coupled with a lack of support from the top and an understanding of how officers should prioritize their time to focus on those most at risk, reinforces the need for training. I’ve reproduced an email involving a motorized bicyclist who was “pulled over” by Phoenix PD; the traffic stop related to the police officer’s confusion over a motorized bike (not requiring license, insurance, tags, etc) vs. a moped (which requires all that stuff. Note how the written response embeds further misunderstanding, along with a veiled threat about “…not impeding traffic”. And how Officer Sills either misunderstands or misstates what constitutes an impeding violation. The driver of a motor vehicle cannot be in violation of impeding in the curb lane (28-704) so long as he is operating at a reasonable speed for the type of vehicle he is operating; this is why, e.g. a heavily load truck, or a tractor, or a ridden animal, animal drawn, or street sweeper, etc, etc are NOT in violation of the impeding statue, despite their slow speed; to interpret otherwise would be to ban slow-speed vehicles from roads, which was never the intent of 28-704A. 28-704C still applies to all, but only on 2-lane roads, and is not a ban, but rather compels the slow driver to provide the opportunity for faster drivers to overtake, and only WHEN SAFE. Officer Sills is no doubt further mixing or confusing a bicyclist’s duty of keeping right (28-815A) without regard for the many exceptions; especially the exception that nearly always applies to laned roads in the Phoenix and metro area: “If the lane in which the person is operating the bicycle is too narrow for a bicycle and a vehicle to travel safely side by side within the lane”. Impeding is not the, or a, problem — maintaining safe space is. Ok, gals and guys, below is the response I received via email from the Phoenix Police Dept. traffic laws must be followed. April 13, 2017 – The confrontation between cyclists and the Paradise Valley Police Department continues. Cyclists have few major problems with other Valley police departments, a notable excepting being when the Mountain View precinct officer Benjamin Carrow was stopping cyclists, runners, and pedestrians passing through the Biltmore complex and threatening them with tickets for violating some non-existent law. Officer Carro must have known that he was exceeding his authority, because he is not only a cyclist, he is a community action officer. However, he had the backing of then precinct commander Glen Gardner, who thankfully has since been replaced and placed under police investigation on an unrelated incident involving “allegations of neglect of duty and unprofessional conduct.” Officer Carro unfortunately still has his job. The Phoenix Police high handedness in the Biltmore complex has ended without the Mountain View Precinct’s admitting it, ex-Commander Gardner, and Officer Carro were in the wrong. However, it seems that every two or three years Paradise Valley has a new police chief who starts a new crackdown on cyclists. To some extent, the police department’s complaints about cyclists are valid. Cyclists do routinely run stop signs in Paradise Valley. However, in other cases, the Paradise Valley Police Department’s treatment of cyclists has amounted to pure illegal harassment. A few years ago, while I was riding on McDonald Drive, I yelled at a motorist whose car came far to close to me. The car turned out to be an unmarked police car driven by then Corporal Nigel Williams, since inexplicably promoted to sergeant. Corporal Williams pulled me over and began haranguing me for such imaginary offences as not riding on the sidewalk (there are few sidewalks in Paradise Valley) and moving to the right to allow cars to pass me. He seemed to me to not be completely sane, and he exhibited an appalling ignorance of traffic law. Finally, he demanded my driver’s license. I explained to him that he had every right to demand that I show him identification and that I would gladly show him a government-issued picture ID card (my passport card). He then wrote me a ticket for riding a bicycle without a driver’s license, writing down some imaginary statue number. I was looking forward to meeting Officer Williams in court and later publishing the audio recording of the hearing on the Internet, but someone in the Paradise Valley administration realized that the ticket was phony and quashed it. I also received a phone call with an apology from Commander Alan Laitsch. To this day, Sargent Williams has not apologized. In an email to me dated April 3 of this year, current Paradise Valley Police Chief Peter Wingert (Paradise Valley police chiefs tend to not last long in their jobs) wrote that “The main concerns voiced to us are the bicyclists riding so many abreast that they impede traffic, including vehicle and pedestrian, and that the bicyclists run stop signs at high rates of speed. ” Fair enough it cannot be denied that groups of cyclists do indeed run stop signs at high rates of speed. That is certainly a legitimate complaint. One can picture dozens of drivers using their cell phones to call the police to report these outlaw cyclists. However, in an email to another cyclist, which I have seen but do not have access to, Chief Wingert wrote that to the best of his knowledge his department had not received a single complaint from a driver… Paradise Valley needs to educate its residents on basic safety rules for walking the streets. February 26, 2017 – Last Tuesday, the Gainey Ranch Group plus some riders from the Hour of Power were reportedly detained by the Paradise Valley Police Department after descending Mummy Mountain of the east side. According to emails I have received from several riders in the group, almost none of the riders were ticketed but all were detained while the police spoke with only a handful of them. I believe that the reason for the detention was the belief that many of the cyclists in the group had previously run the stop sign at Quartz Mountain road, although according to several riders in the group, most of them didn’t run the stop sign on this occasion. Was it illegal to detain so many people who were not accused of doing anything wrong? If so, it would only be one more in a long list of scofflaw behaviors by the Paradise Valley Police. I am planning a story on this event but still have to do some research before I write it. To read an open letter that cyclist Rodney Riley wrote to the Paradise Valley Chief of Police, click here. By the way, a few years ago a scofflaw Paradise Valley police officer wrote me a bogus traffic ticket. The town prosecutor later withdrew the ticket, and I received a telephoned apology from a police commander. The officer almost struck my bicycle with his unmarked police car while he was out supposedly enforcing traffic laws. In our subsequent discussion, it became apparent that he didn’t even understand the basic facts about traffic law that one is supposed to know to obtain a driver’s license. I also got the impression that the officer was not completely sane. At the time he held the rank of corporal. I have been told that he has since been promoted to sergeant. Is it any wonder than many consider the Paradise Valley Police Department to be incompetent? To read the my letter to the Paradise Valley Police Chief in 2012, click here. … Under two previous police chiefs, the Paradise Valley Police Department had a reputation for harassing cyclists who were riding legally. In both occasions, the reputation of the police department was tarnished. Now, history may be repeating itself.